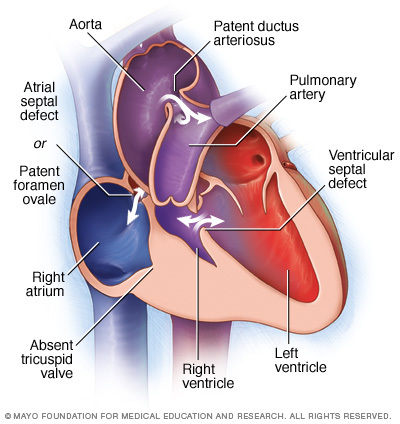 Tricuspid Valve Atresia (TVA) refers to a congenital heart condition that is characterized by the complete lack of a tricuspid valve. This lack of communication between the right heart chambers results in a hypo plastic right ventricle. Because the tricuspid valve is absent NO BLOOD WILL TRAVEL DIRECTLY FROM THE RIGHT ATRIUM TO THE RIGHT VENTRICLE. As a result, less blood will be pumped out to the lungs. Decreased pulmonary markings: this is due to the lack of blood flow to the lungs. Small/absent R waves in precordial leads: similar reasons as to why left axis deviation is seen in TVA. Tall/peaked P waves: the atrial spatial defect permits increased blood flow to the right atrium which causes its enlargement (in turn causing this EKG finding).